Last week, I wrote about Boerhaave’s admiration for the stained glass windows in the St. John church in Gouda, and how his appreciation can be understood in the context of his life and times. Yet of course, the learned man did not write about stained glass windows in his chemistry book just because he thought they were beautiful. Always the scholar, Boerhaave had another reason to be interested in coloured glass, rooted in the medical and chemical theory of the day. 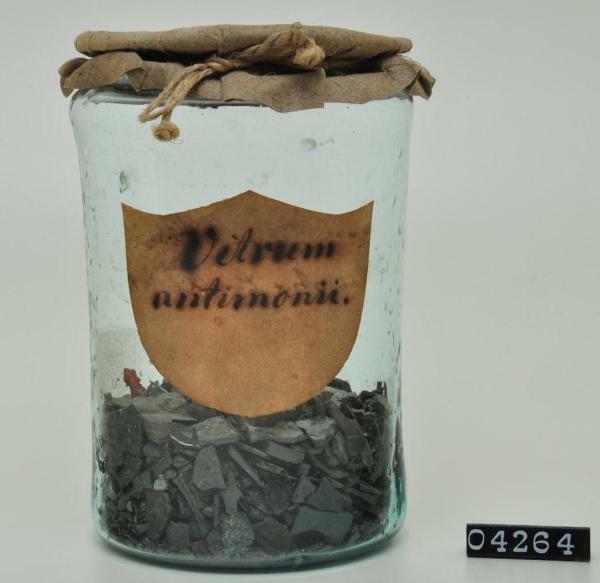 In the Elements of Chemistry, Boerhaave described a number of ways to make coloured glass, but warns that this tends to result in artificial gems that, however lustrous, are more brittle than the real thing. 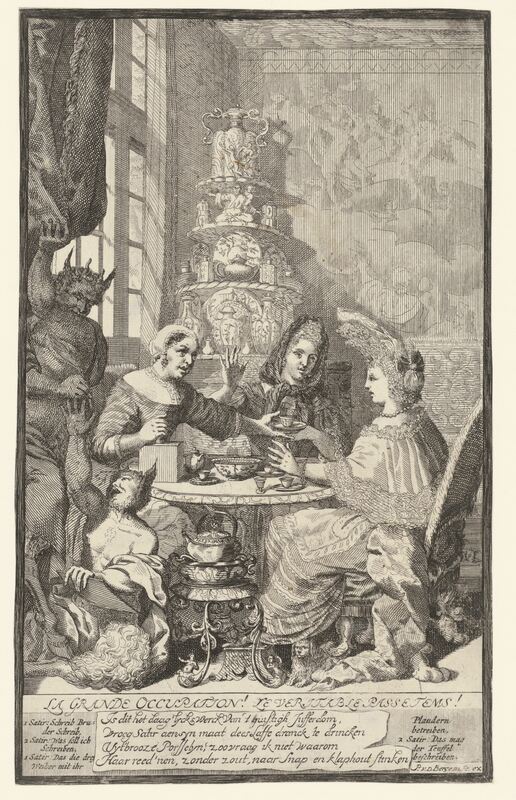 Fake gemstones were used frequently in jewellery and fashion in the eighteenth century, but Boerhaave’s interest in them may still seem a bit curious. However, it is quite understandable in the light of a 1672 treatise by Robert Boyle, one of the alchemists Boerhaave admired. 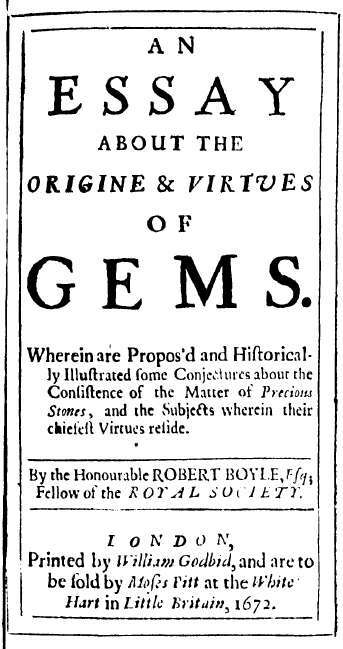 Boyle’s An essay, about the origine and virtue of gems argues that gem stones are infused with mineral and metal juices or particles when they are formed in the earth, either through great pressure, cold, or heat. These minerals and metals have medicinal qualities, and by grinding gemstones to powder, the medicinal qualities can be used in curative potions, creams, et cetera. But gemstones were rare, so it was beneficial for the early modern physician/chemist/natural philosopher to be able to create artificial gemstones with the same properties as real ones. 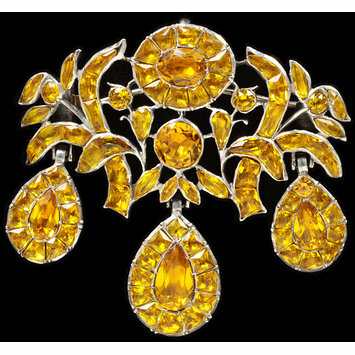 As artificial gemstones are made mimicking the natural process, by infusing crystal with metals, it made perfect sense for Boyle, Boerhaave, and their contemporaries to use both natural and artificial gemstones as materia medica, basic medical materials. Artificial gemstones are an interesting case, as they shows that in the early modern period, the same artisanal and chemical knowledge and practices were relevant for experts in a number of fields, such as glassmaking, jewellery making, chemistry, pharmacy, and medicine. Often, these fields overlapped in more than one respect of course, and as I mentioned last week, studying the use of materials in the early modern period is a route into understanding the work of hybrid experts, people who combined artisanal and scholarly theories and practices. In the future, I hope to make the creation and use of gemstones in eighteenth-century chemistry and medicine one of the case studies in my research project. These initial findings raise questions about how involved university-trained chemists actually were in the making of materials such as artificial gemstones. Did they make them themselves in their laboratories? Or did they obtain them from glassmakers or apothecaries? 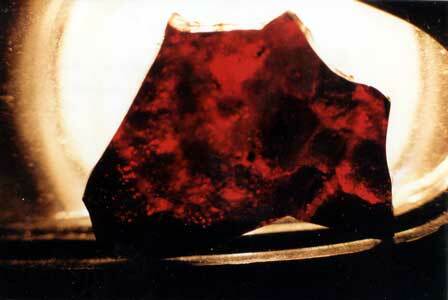 And exactly how were the gemstones used in medicine and pharmacy? What were the various theories about their curative properties, and how were they transferred to the patient? Was the alchemical understanding of gemstones significantly different from the chemical understanding, or were alchemical theories and practices transferred into the chemistry and medicine of the late eighteenth century? But first, summer, and on my program are a research trip to London, to look into a massive manuscript containing lecture notes taken by a student of the Leiden chemistry professor Hieronymus Gaub (1705-1780), presenting a paper at the huge and hugely exciting ICHSTM conference in Manchester, and delving into the work of Abraham Kaau Boerhaave (1715-1758), Boerhaave’s deaf nephew. I aim to keep the Medicine Chest filled with updates! Boerhaave, Herman. A new method of chemistry, 2 Vols, Vol. I, tranl. by Peter Shaw, London, 1741, p. 182-187. Boyle, Robert. An essay, about the origine and virtue of gems, London, 1673. Klein, Ursula, en Emma C. Spary. “Introduction: Why Materials?” In Materials and Expertise in Early Modern Europe. Between Market and Laboratory., Ursula Klein and Emma C. Spary (eds. ), 1–23. Chicago and London: University of California Press, 2010, 1, 6. This week I am diverting a little from my usual focus – I just found this too fascinating not to share it. So far, I’ve mainly concentrated on the use of metals in medicine and chemistry. 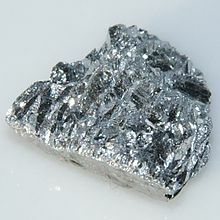 Yet of course, metals were used in numerous other ways in the eighteenth century. There are the obvious applications if making tools and instruments, for money, jewellery, locksmithing, and cutlery. Metals were also essential in other arts and crafts, such as the creation of (coloured) glass. This may seem utterly artisanal, but the skills and knowledge involved were indeed relevant for academic chemists as well, as shows form Herman Boerhaave’s 1732 chemistry handbook. In a section of the use of chemistry for the arts and crafts, he devotes over six pages to making glass, and how to colour it. Partly this makes sense, as a chemist was (and is) dependent on glass objects such as phials and bottles. 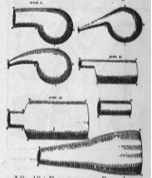 Glass retorts used in the chemical laboratory, from Boerhaave, Elementa Chemiae. The birth of Jesus, window 12 in the St Jan church in Gouda, made in 1564. Subsequently, Boerhaave lists other uses of glass, and the various methods to make it, and how to colour it with different metals. His admiration of the Gouda windows is one of the few insights he gave into his personal preferences outside his professional life. To understand this rare expression of emotion on a subject so different from his usual discourse, it is important to keep two things in mind. First, as convincingly argued by Knoeff in her 2002 book on Boerhaave, the man was deeply devout. Although the church windows at Gouda also contained more worldly, politically inspired images, the biblical representations in the impressive windows must have moved a religious man in a predominantly Protestant country, in which religious pictures -unlike religious symbols- in the public domain were quite rare. Secondly, the Gouda church windows were and are among the great monuments in the Netherlands. For Boerhaave, who hardly travelled and whose farthest journey had been to Harderwijk, about one hundred kilometres from Leiden, these windows must have been one of the most beautiful monuments he saw in his life. However, Boerhaave’s knowledge about and admiration for the craft of glass staining in general and for the Gouda windows in particular also confirms recent scholarship on the boundary nature of early modern chemical and technical knowledge and practices. 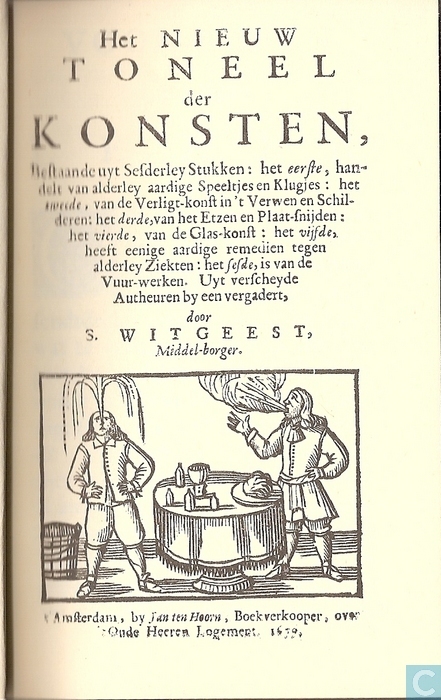 Studying the use of materials in the early modern period is a route into understanding mixed artisanal and learned practices, and reveals the existence of what Klein and Spary call ‘hybrid experts,’ men and women who combined artisanal and scholarly skills, terms, reasoning and explanations. 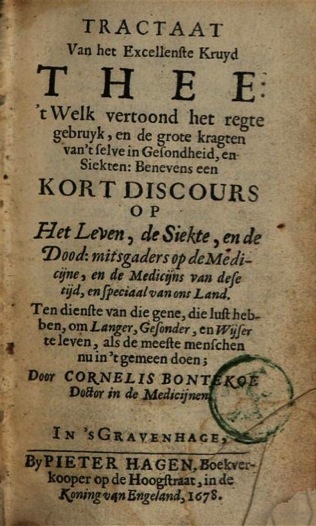 The hybrid expertise of people like Boerhaave and his contemporaries in turn can give us insights in issues such as discipline formation, and the epistemological and socio-economical developments preceding the industrial revolution. Boerhaave, Herman. Elementa chemiae, quae anniversario labore docuit in publicis, privatisque scholis. 2 vols, vo.l. I, Leiden: Isaak Severinus, 1732, p. 180 cont.